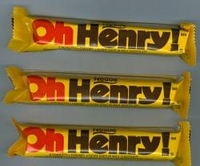 Oh Henry nostalgic candy bar from the 60's. You get mixture of peanuts, caramel, fudge and milk chocolate in every bite of an Oh Henry candy bar. If you�re are a chocolate lover then these are for you. 6 1.8 oz. Oh Henry bars per package.